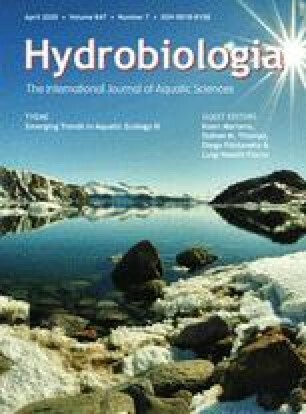 A technique for the rapid surveying of submersed aquatic vegetation by post-processing of data collected using a high frequency (420 kHz) digital echo sounder (BioSonics DT4000) has recently been developed and successfully tested in an estuarine environment by Sabol et al. [Sabol, B. M., R. E. Melton, R. Chamberlain, P. Doering & K. Haunert, 2002. Evaluation of a digital echo sounder system for detection of submersed aquatic vegetation. Estuaries 25: 133–141. ], where it was used to map the cover and height of freshwater tape grass (Vallisneria americana) and seagrasses (Thalassia testudinum, Haladule wrightii and Syringodium filiforme). This technique, which is also spatially referenced by input from a global positioning system, has many potential applications in macrophyte studies in shallow lakes, although it has not yet been extensively tested in such habitats using systems of lower sound frequency. This paper reports such a test in two shallow (maximum depth c. 5.9 m) lakes of the Cotswold Water Park, U.K., using a 200 kHz digital echo sounder (BioSonics DT6000 and DT-X upgrade) and post-processing analysis using the now commercially available software EcoSAV, which incorporates the algorithms of Sabol et al. (2002). Hydroacoustic assessment of the coverage by macrophytes, mainly Nuttall’s pondweed (Elodea nuttallii) and charophytes (Chara spp. ), showed high agreement with those recorded during a simultaneous visual survey by underwater video recording (r 2 = 0.8478, n = 74, P < 0.001). Assessment of macrophyte height was also apparently consistent between the two systems, although the video system could not produce quantitative data and so statistical assessment of the agreement was not possible. Repeated hydroacoustic surveys over the course of the winter of 2003–2004 were conducted in one lake and illustrate the application of this new macrophyte survey technique. Such applications include the rapid measurement of mean Percentage Volume Inhabited (PVI), which fell from 12.15% (95% confidence limits, ±0.55%) to 7.10% (±0.40%) over the course of the winter. We thank Bob McClure of BioSonics and Bruce Sabol of the U.S. Army Engineer Research and Development Center for their help and advice during our hydroacoustic analyses. We are also grateful to Bob McClure for making the EcoSAV software available to us, and to our colleagues Janice Fletcher and Ben James for help in the field. Boat and other logistical facilities were kindly made available by Gareth Harris and Simon Pickering of the Cotswold Water Park Society. This work was funded by English Nature, the Natural Environment Research Council, the University of Bristol, and the Wildfowl & Wetlands Trust. Hoffman, J. C., J. Burczynski, B. Sabol & M. Heilman, 2002. Digital acoustic system for ecosystem monitoring and mapping: assessment of fish, plankton, submersed aquatic vegetation, and bottom substrata classification. White Paper. BioSonics, Inc., 4027 Leary Way NW, Seattle, WA 98107, USA. Available at: http://www.biosonicsinc.com/doc_library/docs/lake_wa_assessment.pdf.